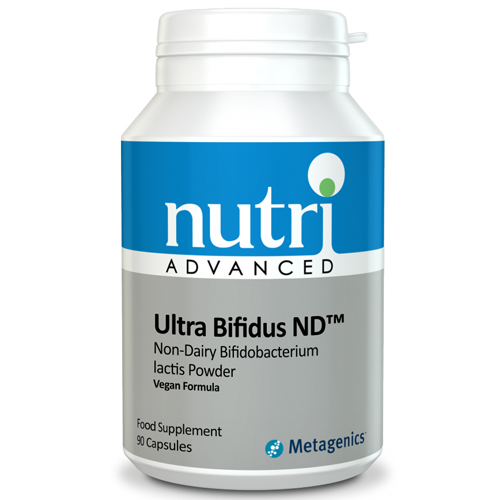 Nutri Advanced Ultra Bifidus ND is a non-dairy** probiotic supplement featuring a specially cultured, highly viable and pure strain of the beneficial bacteria Bifidobacterium lactis Bi-07. Ultra Bifidus ND can be used routinely by people of all ages (infants to seniors). 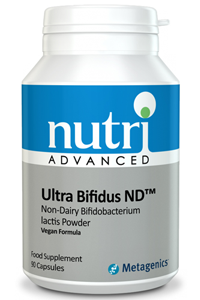 Ultra Bifidus ND has undergone a special process to remove all dairy products and lactose, and is therefore dairy-free. Ultra Bifidus ND is produced in a freeze-dried form and refrigerated during storage and shipping for maximum stability. Mix one-quarter to one-half a teaspoon with 4-6 ounces of un-chilled water daily, or as directed. **The probiotic strains in this formula consume soy and milk-derived nutrients as a food source during an early fermentation step. Individuals with a severe intolerance to soy or milk should not take this product. If pregnant, breastfeeding, taking any kind of medication or have a medical condition, consult a healthcare practitioner before using this product.